Filmmaker Michael Moore and anchor Bill Hemmer were dead-on during Day 1 of the 2004 Democratic convention in Beantown. Note to readers: Day 1 of the 2008 Democratic convention dawns Monday, Aug. 25th in mountain-esque Denver. Four years ago, opening day in Boston produced an odd, breakfast hour altercation between provocateur Michael Moore and the Clark Kent-ish Bill Hemmer, then with CNN and now with Fox News Channel. Your friendly content provider was in the thick of it. The resultant blow-by-blow account was first published on July 27, 2004. BOSTON -- Talk about your convention floor fights. "That's absolutely the most despicable thing I've ever seen!" 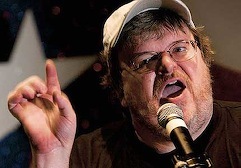 Fahrenheit 9/11 filmmaker Michael Moore roared at a surprised Bill Hemmer, who had interviewed him roughly 45 minutes earlier on CNN's Monday edition of American Morning. Your faithful firsthand witness, who was quietly interviewing Hemmer at the time, perked up noticeably at this sudden surge of indignation. Here's how it unfolded on a morning that began with Hemmer's comparatively uneventful 7:20 a.m. interview with an entourage-escorted Hillary Rodham Clinton. Mrs. Clinton wore an impeccably tailored salmon-colored pantsuit, caramel pumps and regularly reapplied lipstick during a convivial media go-around that also included one-on-ones with CBS' Dan Rather, CNN's Judy Woodruff and ABC's Chris Bury. Moore was his usual rumpled self in jeans, black T-shirt and jacket, sneakers and a green Michigan State Spartans baseball cap. Hemmer, operating from CNN's showy new convention-foor anchor stage, decided to parry with Moore amid the empty chairs of the filmmaker's home-state Michigan delegation. Near the end of their live interview, Hemmer told him, "I've heard people say that Michael Moore is the greatest living American." "Oh, who are those people?" Moore retorted jovially. "I've heard people say they wish Michael Moore were dead," Hemmer continued. "Oh, well, jeez, who would say that?" Moore asked in turn. Any negative reactions to Fahrenheit 9/11, which recently topped $100 million at the box office, are from "that minority of Republicans and right-wingers who are upset because they know their days are numbered . . . And so they're all running around, all saying crazy things like that," Moore contended. The interview soon ended after the two exchanged pleasantries. Moore then was surrounded by mostly television reporters who peppered him with questions. After about 10 minutes of this, he said offhandedly, "I don't want to do CNN. No more CNN, no." No one seemed quite sure what he meant, and the remark went unchallenged while Moore continued with his impromptu media conference. Fahrenheit 9/11 has "two villains," he said -- President Bush and the mainstream media. "With all due respect to network anchors, the movie is a bit of an embarrassment to them," he said. "I think they know that the early days of this war were not their bright, shining moment . . . The patriotic thing to do if you're a reporter is to ask tough questions." All well and good. But the more he thought about it, the more Moore became incensed by a comment from his exchange with Hemmer. The irate filmmaker came charging toward Hemmer as the CNN anchor talked to yours truly about the plusses of a floor-level stage that, alas, partially blocks the view of the Arkansas delegation. "Some people want you dead," Moore said, repeating the anchor's on-air remark to him. "Would you say that to (John) Kerry or anyone else? I mean, why would you do that? That's absolutely the most despicable thing I've ever seen!" Hemmer had no immediate answer, leaving Moore to move on to another interview with a media gaggle still in tow. The anchor then said he had no regrets. "I've heard it from a number of people," Hemmer said of the "dead" comment. "It's clearly an emotional film that divides people about their feelings." And as for Moore's feelings toward him? "He offered to shake my hand at the end of the interview," Hemmer said. "Why he's doing this now, I don't know." The Arkansas delegation, by the way, will be receiving a gift bag of items emblazoned with CNN's logo, including a visor, T-shirt, pen, buttons and mints. "I think the other delegations will understand that Arkansas is bag-worthy," CNN spokesman Julianna Evans said. Note to readers: Bernie Mac, who died on Saturday at age 50, gave Fox exactly what it wanted -- an edgy, anti-Cosby Show whose father figure yearned to take unrepentant physical action against the three kids who'd invaded his palatial home. Of course he never did. He just talked tough to the camera, addressing viewers as "America." As in, "Now America, tell me again, why can't I whip that girl?" Fox, in a statement issued on the day of his death, called Mac "a gifted talent whose comedy came from an authentic and highly personal place. He was a tremendous live performer and a wonderful actor. Fox was proud to be the home of The Bernie Mac Show." But its five seasons easily could have been more. 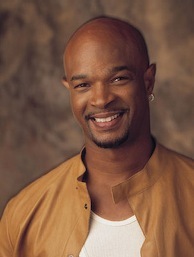 Fox constantly shifted the show from one night to another, and in its second season moved it to compete against ABC's My Wife and Kids with Damon Wayans. At the time they were the only situation comedies with African-American casts on the Big Four networks of Fox, ABC, NBC and CBS. The following two articles are a look back at Mac's first session with TV critics (originally published on July 18, 2001) and the controversy surrounding Fox's decision to pit Mac against Wayans in fall 2002 (originally published on July 22, 2002). PASADENA, Calif. -- A Bernie Mac attack is coming this fall to Fox. You want fries with that? "We're gonna keep it real, as they say on the street. Keep it real -- whatever that means," Mac joked Tuesday. "I'm black, and I don't even know what that means." The chunky stand-up's talk-to-the-camera series could be both a breakout hit and a breakthrough in so-called "urban" sitcoms. The Bernie Mac Show, in which he plays a "tough-love" surrogate father, is on film and without a laugh track or the loud, whoooo!-fueled histrionics that long have bamboozled the genre. Notable exception: 1987's critically praised but short-lived Frank's Place, which starred Tim Reid as a New Orleans restaurant owner. Oozing class and shorn of canned haws, it got creamed in a time slot opposite ALF. Mac, 43, had just started a gainful comedy club career in the year Frank's Place went down. Ringwise and recently memorialized in Spike Lee's The Original Kings of Comedy, he's ready to expurgate himself without losing his bite. For the purposes of network TV, that means dropping the hard-core language he deploys in nightclubs. It'll be a snap, he says. "You have to know where you are," he told a receptive roomful of TV critics. "I'm very versatile.It doesn't matter which way the wind blows as long as I get a breeze . . . We're tapping into a whole different audience. 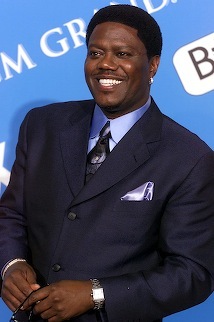 You'll see another side of Bernie Mac that you didn't know exists. 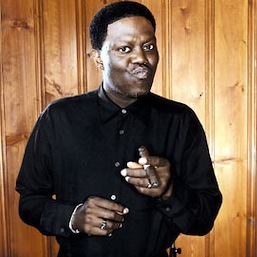 Bernie Mac is talented." The third-person bravado works for him. Mac is a five-star charmer in person. And on his distinctive and very funny Fox show he talks bluntly about corporal punishment while still coming off as a soft touch. The flak catchers are three kids -- ages 5, 8 and 13 -- inherited from his drug-addicted sister. In what likely will emerge as the signature line from the premiere episode, Bernie finally loses all patience with headstrong Vanessa, the oldest. "I'm gonna bust your head 'til the white meat shows," he threatens her. That's quite a slice of "tough love," not that "Uncle Daddy" means a word of it. Mac said the line comes from his real-life grandfather, who was a church deacon at the time. When 12-year-old Bernie broke a church window there was hell to pay. Or at least that's what he was led to believe. "Bernie is a chump, OK?" Mac said of his TV character. "His bark is bigger than his bite. You can see he's soft. Bernie does not hit his kids. My grandfather used to always (reach for his belt). And we'd beat ourselves up trying to get away from him." 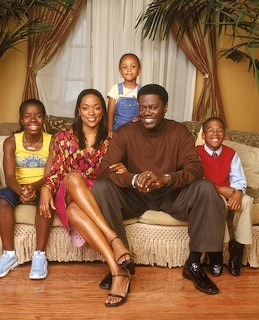 The Bernie Mac Show is scheduled on Wednesdays at 8:30 p.m. following holdovers Grounded for Life and Titus. That puts it in an integrated prime-time neighborhood, a stark contrast to UPN's much-criticized "ghettoizing" of its four high-decibel black sitcoms in a Monday night cluster. "We hope in particular that a young, male audience, irrespective of race, is going to want to watch Bernie," said Fox Entertainment Group chairman Sandy Grushow. "He's a guy who has a real ability to cross over." Bernie Mac's executive producer, Larry Wilmore, is a former staff writer on a previous landmark Fox "crossover" hit, In Living Color. "It really isn't so much a racial-cultural thing as a social-cultural issue," he said of the show's against-the-grain take on modern-day parenting. 'Society was a bit more authoritarian when we were kids. we are a little more lax today as parents. And the show is dealing with those two issues -- old school vs. new school." School will be out all the way until Nov. 5. Bernie Mac and many of Fox's new and returning shows will be getting late starts because of the network's contractual commitments to baseball's playoffs and World Series. "I definitely don't want to look stupid, and I mean that sincerely," Mac said. "I don't want to be buffoonish in any kind of way. I want this to be a smart show." PASADENA, Calif. -- Damon Wayans is taking it personally while Bernie Mac takes it in stride. Whatever their game faces, it's a pity that the Big Four networks' only situation comedies with African-American casts will be adversaries on Wednesday nights at 7 p.m. this fall. Fox called the shot, moving The Bernie Mac Show up one hour to bang heads with Wayans' My Wife and Kids, which stayed in place on ABC. The shows respectively ranked first and fifth in black households last season, according to Nielsen Media Research. Bernie Mac averaged 5.9 million households per episode, 2.4 million of which were black. My Wife and Kids had a stronger "crossover" following, with 7.5 million homes, 1.9 million of them black. Wayans, who co-starred on one of Fox's first major successes, In Living Color, says that shows with predominantly black casts helped to build that network. Pitting Bernie Mac against Wife and Kids is primarily a competitive move, but also "racist because they (Fox) don't have the same emotional investment in black shows that they do in Malcolm in the Middle or The Simpsons," Wayans said at a recent ABC party. "I don't think ABC should move my show after what Fox did. It would just look like we're scared. We're not scared. We're offended. There's a difference." Mac, speaking via satellite Sunday from Baltiimore, said that Wayans had asked him to protest Fox's decision. He declined. "Wherever I am, I have to play," Mac said. "It just raises the bar for me . . . 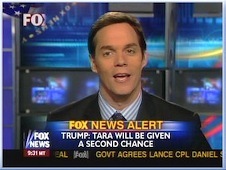 I have no problems with Fox. It's a business. Whatever he (Wayans) has to do, he has to do. But it has nothing to do with me." Larry Wilmore, co-creator of Bernie Mac, said the Wednesday night matchup doesn't have to be fatal to either show. "I think they both can survive . . . I don't think there was any insidious decision to do this," he said. "I can't imagine Fox saying, 'Hmm, we have to kill this black show.' "
Sandy Grushow, chairman of the Fox Television Entertainment Group, said that ABC played hardball last fall by premiering a two-hour NYPD Blue season-opener opposite the premiere of Fox's 24. "We really don't feel like we're under any obligation to ensure the success of any of our competitors' shows . . . So whether casts are black, white, green, yellow, purple -- we're in a business here," Grushow said. ABC is pairing Wayans' show with network TV's only Latino comedy, George Lopez. And Fox is using Bernie Mac as a Wednesday night lead-in to its new Cedric the Entertainer Presents variety series. Other than PBS' American Family and tiny UPN's Monday night bloc of our African-American sitcoms, these are broadcast television's only series relying primarily on minority lead characters. Bruce Helford, who co-produces George Lopez and Drew Carey for ABC, said that Fox's gamesmanship "stinks." "I think it's a very cynical move to put Bernie against Damon." Wayans said he'll fight for his show's life, but "will not take any joy" in victory. "If we beat 'em, it sickens me to my stomach," he said. "That's a war I don't want to win, but I have to. I've got to elevate my game. It just comes down to being funny, and I hope to God that both shows make it."